I am a huge fan of keeping your training sessions simple. A lot of us are crunched for time, but that doesn’t mean you can’t get in a great session in under an hour, including your warm up and cool down. With these shorter sessions, you want to make sure that you are getting the most bang for your buck. That means using larger movements that incorporate more muscles and will burn more calories, both during and after the training session. Today, I want to give you a full body training session that requires minimal equipment and can be done anywhere. All you need is two kettlebells and a few feet of space. 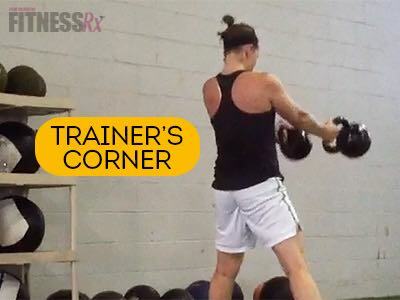 With this workout, you’ll be incorporating the double kettlebell (KB) swing. This takes the same principles of a standard KB swing and adds an element of extreme core stability. Holding two weights also increases the load and changes the angle of your body slightly. If you have not done a standard single KB swing, start there and work your way up to two. Once you can swing at least 20kg, you are ready to try the double KB swing. In the video below, I demonstrate this exercise using two 24kg bells. However, a good starting weight is 10-12kg. Gradually work your way up to the heavier kettlebells once you’ve mastered the movement. – Place your feet about shoulder width apart. This is wider than a standard swing, as you have to accommodate for the two bells so you don’t hit your knees. – Start with your palms facing each other in an athletic stance with your hips back and knees slightly bent. – Pull your chest up and squeeze your shoulder blades, setting your elbows close to your body. – Create full body tension by squeezing your upper back, abdominals, lower back and legs all at once. – Take a big breath and begin your first swing by driving your hips up and forward with force. – Relax slightly and let the bells swing back into you. Continue this motion for the prescribed time or repetitions. – When you get to the last repetition, if you are on a soft surface, just let the bells drop and take one step forward. If you are on a hard surface or in the gym, slowly bend your knees and lower the weights to the floor. – Your goal for any swing should be to get the bell (or bells) up to shoulder height. Once you do that, you can increase the weight. Anywhere between the belly button and shoulders is a good range. Always work to increase the height as you go along. *If you are just starting out, you can do this with a standard swing instead of the double. Be sure to leave a comment below if you tried the workout, and let me know how it went for you.